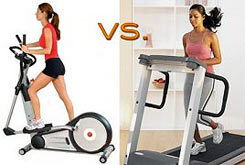 Elliptical vs treadmill, here is an article for the beginner runner on the differences of training on each one. The main difference between an elliptical machine and a treadmill is that the treadmill runs on a belt and the elliptical runs in a circular motion. 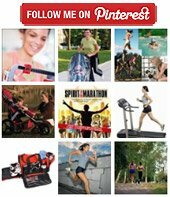 If I were buying a piece of home workout equipment, I would probably choose the elliptical over the treadmill because I can always run outdoors, although recently I have seen elliptical machines being ridden outside like bicycles. Now that looked neat! Both of these are a great workout. The elliptical is less torturous on the joints because you're not taking as much of a pounding. When I'm the elliptical, I feel more like I'm doing a dance. It's a lot of fun to workout to music on the elliptical. I also love the elliptical for when I'm tired of running and need a break, either for a few days or even in the middle of a run. If you are a runner, the elliptical is not the ideal cross training workout because it still works out the same muscles. However I love the ellpitical for when I feel an injury coming on and need to get in a similar cross training workout without taking such a beathing ot my joints. 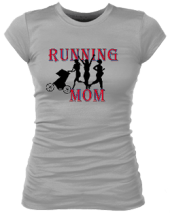 The elliptical is more like running on the lower levels and more like biking on the higher levels.